← Signing off… on another novella! 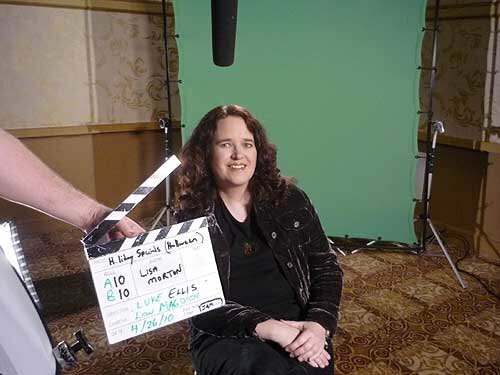 I’m very privileged to have multiple Bram Stoker Award winner Lisa Morton on my blog. I’m currently collaborating with her and Rocky Wood on the non-fiction graphic novel Witches!, which will be published by McFarland in 2012. What made you decide to take up writing as a career and what was your very first paid writing gig? counselors were all horrified when I told them I wanted to be a (screen)writer. They all spent the rest of my school years trying to argue me out of it. MEET THE HOLLOWHEADS. My first real prose sale didn’t happen until a few years later, when Stephen Jones bought my story “Sane Reaction” for DARK VOICES 6. When did this obsession with Halloween begin and how? wonderful reviews) that it just made sense to keep going with Halloween. Over the years you have acquired significant amounts of knowledge on the history of Halloween and you update your encyclopaedias fairly regularly … is there really still more for you (and us) to learn? One of the interesting things about Halloween is how malleable the holiday has been throughout its history. It seems to undergo pretty serious transformations every 10-30 years; just in the last 10 years alone we’ve seen the explosion of the haunted attractions industry to the point where Halloween and haunted houses are almost synonomous, and that would have been unthinkable just a few short decades ago. home in ten minutes. It really is amazing what’s available in digitized form online now. What’s the appeal of Halloween in the US? Does anyone appreciate that Halloween is a lot more than just trick-or-treating? Halloween serves a number of functions, and it even varies slightly on where you are in the U.S. In more rural areas, it’s still part harvest celebration and identified with trick-or-treat; in more urban areas, it’s now an adult celebration with an emphasis on haunted houses and parties. In either case I think it’s actually about empowerment – the thought of becoming someone else for a day is very freeing for most Americans, and perhaps moreso in these days when very conservative and repressive political ideologies are in the headlines nearly every day. We’re also seeing the rise of Dia de los Muertos in many urban areas, brought here by Latin American immigrants, and that holiday is finding a real home as well. Dia de los Muertos brings with it a playful exploration of death as a real event, not something to be avoided and shunned, and it’s found a small but growing receptive audience here, north of the border. Who were your biggest influences in your early days of writing? Do those authors still inspire you? authors like Dennis Etchison and King. It’s probably a wonder that I’m not writing science fiction. The most recent Stoker Awards you’ve won were for The Samanach (long fiction) and the other for The Castle of Los Angeles (Superior Achievement in First Novel – joint winner). What were the inspirations for those works? THE SAMHANACH came out of my Halloween research. I thought it would be interesting to create a work of fiction that also served as a mini-history of Halloween, and when I came across the notion of a shapeshifting, child-stealing Scottish demon called the samhanach, the rest just fell into place. THE CASTLE OF LOS ANGELES was a much longer process. I’ve always loved the traditional Gothic novel, especially the works of Ann Radcliffe, and I felt that most of what’s labeled “Gothic” these days really isn’t – someone like Anne Rice incorporates a few Gothic elements, certainly, but she’s really not a true Gothic writer. I wondered if it was possible to use all of the tropes of the true Gothic novel – the orphaned heroine, the haunted structure, the strict caste system with an aristocrat as antagonist – in a genuinely contemporary novel. About the time I was thinking along those lines, I had friends who ran a small theater in a real place called The Brewery, which is the largest collection of artists’ lofts in L.A. Somehow those two thoughts just meshed, and CASTLE was born. Give us an idea of how you approach your writing. One minute you might be writing a movie script, the next a short story or you might be doing some of the dreaded editing. Give us “A day in the life of Lisa Morton, multi-faceted writer”? recently pounded out a few works of short fiction for books I’d accepted invitations into, but otherwise my schedule will be focused on these two books for the next three months at least. And yes, there are already two fiction projects I’ve contracted for as soon as these are done, but I’m not talking about those just yet. You’ve written non-fiction and fiction works. Do you enjoy them equally? Non-fiction is certainly more labour intensive? on the occasional screenwriting project, which these days mostly falls into the realm of uncredited script doctoring gigs. What are you working on at the moment… any impending releases? in contemporary Southern California settings. Each story is accompanied by a little essay about its setting, so it’s pretty unique. We’ve heard that you will be taking over the role of Vice President of the Horror Writers Association. Do you have any goals at this stage? series BLOOD LITE, but we can do more, including moving into e-books. I’m also excited by a project now underway to organize HWA’s chapters at last. I think our chapters are HWA’s most underused resource, and it’s time to change that. How do you see the horror genre at the moment and overall publishing industry? Major booksellers are collapsing, some small presses are struggling and e-books are growing in abundance. How can the horror genre maintain its place? Personally, I think the genre no longer needs to worry about merely “maintaining”, and is ready to seriously grow again. While it’s true that major booksellers are collapsing, independents are starting to come back. And I’m one of those who doesn’t believe that e-books will replace printed books; they’re going to exist comfortably side-by-side for a long time. It’s all good, and it’s all good for horror. What are you currently reading now? I wish I could report something great, but I’m basically reading nothing but research materials these days! I’m even reading non-fiction works that aren’t directly related to one of my specialties just to study styles. The last novel I read was Gillian Flynn’s SHARP OBJECTS, and I did enjoy that very much. I can’t wait until I have time to read fiction for pleasure again! If you could any advice to an up and coming writer, what would it be? Take it seriously or don’t bother. I know that sounds harsh, but it’s true. Too many new writers think that they can get away with not knowing certain basics, or with only putting in a few hours, or with not rewriting. If your grammar’s not great, go away and study Strunk and White and then come back in a few months. Don’t watch five hours of television every night and think you can still write. Don’t send out your first draft and expect it to sell – it won’t, and may just end up embarrassing you with editors and agents. Approach it as you would any other job. It’s a tough business and there’s lots of competition, so if you go in with a slipshod approach, that’s what you’re going to reap.